I love brewery tours. Any time you get a glimpse behind the scenes there is potential to learn some pretty interesting things. While the basics of brewing are the same around the world, each brewery brings a unique spin to the process. I tried to visit Great Divide’s brewery/ taproom in downtown Denver some years ag o, but was foiled by an unexpected closure. Luckily I managed to time it right on my recent American trip, and had a great time learning about one of America’s top craft brewers and sampling some excellent Colorado beer. 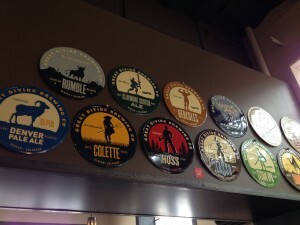 Great Divide is a very Colorado company. Named after the Continental Divide that separates the eastern and western watersheds of North America, they were one of the very first wave of Colorado craft brewers. Great Divide was founded by Brian Dunn in 1994. Like many of those early craft brewers Brian was a home brewer who saw a niche waiting to be filled. As this was before the ongoing explosion of everything craft beer related, a lot of banks refused loans because they simply did not understand what this “microbrewing” thing was. “We already have Coors and Budweiser, what more can you add to the market?” Things are a little easier now but it was a very different landscape in those days. 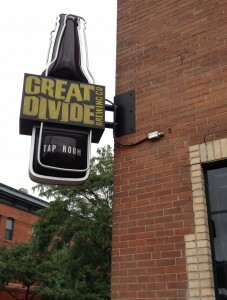 Luckily, Great Divide managed to make a deal with the city of Denver to help with a loan. In return for the money the brewery would locate their operations near the new baseball stadium that was being built for the Colorado Rockies Major League Baseball team. Things worked out great for all invovled, and now Great Divide is a very well regarded brewery nationally and still an anchor of the Ballpark Neighborhood. We arrived shortly afte r the taproom opened, and it was a good thing we did. Things got busy fast, despite it being a rainy Tuesday afternoon. The tour is free of charge, and you can relax in the tap room while you wait for things to start. 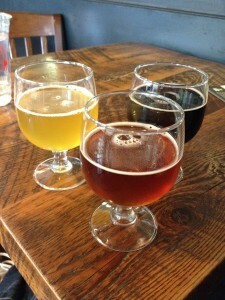 I really like what Great Divide does with their tasting flights. It is $3 for three tasters, and $1 to add one more to the base three. In Japan $3 per glass would still be a reasonable price, so this was a fantastic deal to those of us on vacation. Even the locals thought it was a pretty nice price. The taproom has 16 taps with both year round and seasonal beers available, so it is worth stopping by even if you don’t want to take the tour. The tour itself was great, with plenty of stories about the growth of Great Divide and craft beer in general. The space they currently occupy has been many things over the years. When they started brewing they had to share the building with some band practice space. 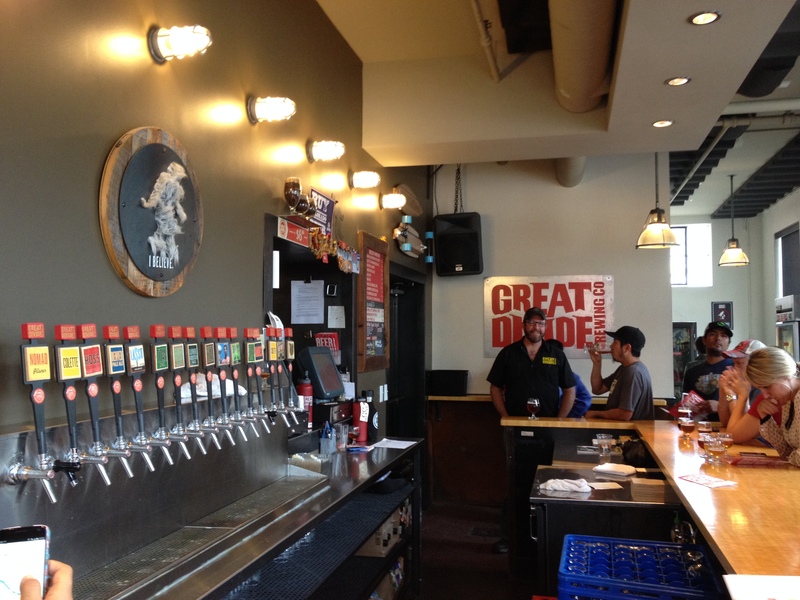 Now of course the whole building is devoted to brewing, bottling, and packaging Great Divide Beer. Things have been so successful that they will soon be opening another brewing location nearby to keep up with the demand. In fact a week later I saw that Great Divide beers were even available on the East Coast. That was exciting, though I d o wish they were available in Japan! I made excellent use of the tasting room, both before and after the tour. My first sample was the Claymore Scotch Ale, a smooth malty brew just perfect for drinking in the highlands. The Scotch Ale is also called a Wee Heavy, which is such an evocative name! It is a stronger version of the Scottish Ale and is noted for a complex malt character with low bitterness and higher alcohol. Moving across the English Channel I sampled a Collette Farmehouse Ale, Great Divide’s take on the Saison style I talked a little bit about the other week. I really liked the Collette. It was an excellent summer beer that was light and refreshing while maintaining complexity. The final beer in my first flight was the summer seasonal Showdown Rye IPA. Rye beers are pretty interesting. Like wheat, rye was used in Bavaria as a common brewing grain for centuries in beers called Roggenbier that were about 25% malted rye. However rye eventually fell foul of the famous Reinheitsgebot, the German Beer Purity Law that mandated only using malted barley, water and hops in beer. A major reason for the law was to make sure that in lean years wheat and rye would be in bread where they belonged. Rye then disappeared from beer until 1988, when it showed back up in Bavaria. While the German Roggenbier style is a more malty, bready flavored beer the Americans have naturally decided to try throwing tons of hops into some of their rye recipes. The spicy flavors and dry finish of rye actually goes quite well with a hop forward beer like the Showdown. I like rye it because it brings new things to beer without being overwhelming. Great Divide also makes a more Germanic inspired rye lager called Hoss that I sampled later. It was fantastic, and again the rye added a nice spicy character in the malts that complemented but did not drown out the hops. Interestingly enough, later on in the week I got to do a rye beer tasting and Hoss was in the line up. Another beer I sampled a bit was the Yeti Imperial Stout, both the standard and Oatmeal versions. Yeti is one of the stars of the Great Divide lineup, and wow was it intense. I liked the Oatmeal Yeti better, it was creamier and sweeter and just seemed more balanced. I think your feelings about Yeti will come down to how you feel about very malty and very boozy beers. I tend to prefer dryer, hoppier fare so while I could enjoy the Yeti for what it was, I do not think it would ever be a daily beer for me. It is just so strong and so flavorful. My trip to Great Divide was fantastic. A fun tour paired with amazing beer is hard to beat. I have a reservation for another brewery tour, this time of Yo-Ho brewing in Nagano, so look for that write up in a few weeks. In the meantime, get geared up for the Fall Keyaki Beer Festival, which is coming up on the 18th to the 23rd of September. As well, I advise anybody with an interest in the foreigner impact on Japanese craft beer to check out this article from the Financial Times. 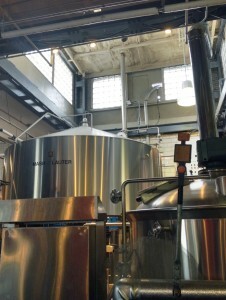 This entry was posted in American Beer, Brewery Profile, Brewery Tour and tagged Brewery Tour, Colorado, Denver, Great Divide, IPA, Rye Beer, Saison, Scotch Ale, Wee Heavy. Bookmark the permalink. Three dollars for THREE GLASSES of beer is madness! A buck a beer! How many did you drink, all told? I think six or seven? I sipped from a few more. So many delicious beers, so little time! I would think the company would be just as good as the beer. If I were drinking, that would be at least as important as the beer.